Modernizing Dungeon Siege, potions now have custom color names! 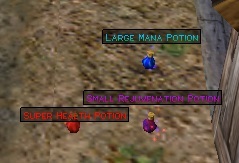 1.0 - Mana, Health and Rejuvination potions are colored. Modernizing Dungeon Siege, potions now have custom color names! [NOT YET COMPATIBLE WITH DUNGEON SIEGE REVIVED].